Luckily, Nevis was not at all affected from hurricane IRMA 2 weeks ago. Neighboring island like Barbuda, Antigua, St. Martin and St. Barth were heavily damaged though. 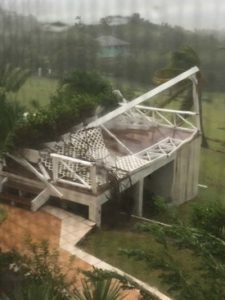 Hurricane MARIA came in on a slightly different path, hit Dominica in a very bad way and then came directly to Nevis, hitting on Tuesday around 2 pm with heavy winds and torrential rains. We lost some trees and frangipani, as well as the trellis on the east side of the pool deck which gave those lounging under it a fine natural green shade and those above in the house a weekly change of new flowering of a clematis-like beautiful local plant. David Johnson, our caretaker living in the house could obtain a pump and after 5 hours working it, he got all the water out of all rooms at which time the heavy rains started once again…. If I have further important information, I will make updates as and when it becomes available. Uschi and I expect to return by December 20th. Peter, danke für die Message. Wir hatten Glück, die Schäden waren alle selbstverschuldet durch fahrlässige Bauweise. Unser live-in caretaker hatte viel Arbeit, auch die Gärtner mussten etliche truckloads wegräumen. Dominica hat wie St. Martin sehr große Schäden und wird Jahre brauchen zum Wiederaufbau. Dir alles Gute mit den Behandlungen. zu beschäftigt mit meinen Behandlungen. Alfred, Irma konnte uns nichts anhaben, Maria dafür etwas mehr. Alle Schäden waren aber menschengemacht – der Aufbau vom Trellis war zu schwach, der Erbauer hat 2×2 inch statt 4×4 inch Hölzer verwendet, wie es abgemacht und verrechnet war; er sagte später, es hätte damals keine starken vorrätig gehabt auf ganz Nevis… und der Deckel vom Überlauf der Zisterne war falsch in den Schlafzimmern platziert worden anstatt ausserhalb des Hauses vom sonst sehr erfahrenen Erbauer. Dass ein paar Bäume und Stäucher draufgehen, ist normal. Vielen Dank für die Information, Willi. Mein Bruder hat mich letzte Woche gefragt, wie es wohl in Nevis gehe – jetzt konnte ich ihm antworten. Ich habe sehr gute Erinnerungen an Nevis – wo ich im Februar 2013 einige Zeit verbringen durfte! sorry to hear the damage caused by maria. fortunately the main house seems to have withstood remarkably well. take tour lesson and avoid future unsound modification while remembering in future we will have to face frequently even mightier tornados. mr trump unreasonable stance will not help i am sad to add. wish you both perseverance und luck to keep your home protected from future calamaties. Hi Charmagne, we are not on Nevis from March to December but David Johnson looks after our house well. He did a lot of pumping water from the overflow of the cistern that was not built right at the start but otherwise our damage was not so much even during Maria. Hope to see you in December. Thanks Ruedi & Emmi, Congrats for your 60th jubilee of your diamond wedding day with your engineering diploma! Sumo will come again next May, so god will. We are happy to read, you are in good shape ! We remember our first taifun in ashia, oct. 1964,the front part of the roof blown away ,I was hanging on the roof beams,but the I let go! We celebrated in Soleure, 60 years after diploma of engineering with study friends, combined with our diamant wedding day! But it turned out well. I still follow sumo and think of Willi, the expert. We have been so concerned for the people on Nevis. Trying to keep up with all conversations. Thanks Kimo & Karen, we’ll see ourselves when we return. Our caretaker will do his very best to repair everything that is necessary. Hopefully the house will be in good condition when you return…and you are fortunate that Irma didn’t do the damage to Nevis that it did to your neighbor islands.